Poker is an extremely broad term that covers a large number of card games. Texas Hold’em is the most popular variant these days, but it was not always this way with Five Card Stud and Straight being heavily played. The games in the poker family usually have the winner determined by hand ranks and betting rounds. In most variations of poker some of the cards in any given hand remain hidden, allowing strategy, in the form of bluffing and the ability to apply pressure depending on your position at the table. The winner of a poker hand at showdown is usually decided by the best hand rank, or the best five-card combination you can make. Each variation of poker has different rules that could alter the betting, or how the result is determined. For instance, the pot winner might be a player with the best hand and the worst hand. Or in one version of poker, called Razz, the player with the worst hand wins. The number of cards dealt to each player varies depending on what type of poker you are playing, with Texas Hold’em, Omaha, Five Card Stud, Casino Hold’em and 5 Card Draw some of the most popular. There are obvious similarities between games in the poker family, which we’ll talk further about later in this article. Well-known English actor Joseph Cowell wrote about poker being played in the 1820s in the USA. 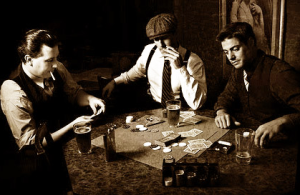 While this is likely to be the first properly documented case of the game being played, there are plenty of games that bear resemblance to the modern-day poker we see being played. In those days a common method of travel along the Mississippi River was riverboats, with travellers often passing the time by playing poker. The game soon spread as people migrated West, largely chasing a fortune in gold. At the same time it became popular among military personnel as an activity for their downtime. You can picture it now: a huge group of young men earning money they could not spend. Why not gamble it? The variations documented in these early periods were 5 Card Stud and Straight poker. While these early days of poker history are the first known mentions of ‘poker’ there were games played in 10th-century China bearing resemblance to it, as did other games played in 15th-century France. The legend goes that Queen Victoria heard the US Minister for Great Britain explaining the game to some other political types, before asking for an explanation and then bringing the game to Europe. The expansion of poker continued during World War I with US soldiers teaching many troops of different nationalities their game, and it started to spread like wildfire. We know what poker is today; this largely began in 1970 when the World Series of Poker was born. While it was a USA-focused event, it began to garner popularity globally. Early champs included Johnny Moss, Bobby Baldwin and Doyle Brunson. From here on in the stakes got higher and higher, the game play more strategic, with the first releases of poker strategy guides coming in the 1970s. These early paperbacks are extremely thin in comparison with the tomes we can find today. Play poker at casinos became popular from the 1970s and it grew as a game played between friends for money at homes and underground bars. The real boom came when online poker was introduced, with players from all over the world playing against each other for real money. From the early 00s poker websites have serviced players worldwide, although the USA made a stand against this horrible pastime a few years ago, when it shut down operators such as PokerStars. The online poker boom changed the face of the game for professional poker players; the stakes are high, the casinos are lush and the spoils can make multi-millionaires of players such as Phil Ivey, Daniel Negreanu and Phil Helmuth. The WSOP has grown into a global phenomenon that causes stampedes at the airports as the best players from around the globe converge on places as diverse as Melbourne, Los Angeles, Macau and London. Players are regularly playing for pools well in excess of USD $1,000,000, with some of the biggest tournament pools topping $10,000,000. A poker game usually begins with an ante, or at the very least blinds. The ‘big’ and ‘small’ blinds are usually the two players to the left of the dealer. These players cough up set sums which are the full amount of the blind level and half the amount of the blind. The game then goes around clockwise with each player either calling, folding or checking (if they are in the blind position). As more cards are added into the mix there are further betting rounds, until everyone folds, bar one player, or there is a showdown. Players are competing to get the highest poker hands from the available cards. The common rank of poker hands is below. The described gameplay would be in a common variant of poker such as Texas Hold’em or Five Card Stud. Royal Flush: 10, Jack, Queen, King, Ace all of the same suit. Four of a kind: Four cards of the same denomination. Straight Flush: Five cards in succession of the same suit. Full House: One pair plus three of a kind. Flush: Five cards of the same suit. Straight: Five cards of any suit in succession. Three of a kind: Three cards of the same denomination. Two pair: Two sets of cards of the same denomination. For instance two 10s and two Jacks. Pair: Two cards of the same value such as two 9s. High card: Any card which doesn’t fall into the categories above. Poker on the internet is big business. You can log into PokerStars right now and find upwards of half a million people hitting the virtual felts. The World Gambling List will delve further into the online side of poker in another article, but for now it’s important you are aware there might be specific laws relating to poker, or online gambling, in your country. While Texas Hold’em is the most frequently played online poker game at the big websites, you will find active games of most variants. The best poker website for you depends on where you are from. For instance, the USA has harsh laws on online poker, so they cannot play at many of the companies which have withdrawn from their market. A popular website which services USA players is Americas Cardroom. Of course, much of the world is serviced by PokerStars and Full Tilt — both owned by Amaya Gaming, who bought the parent company of both websites in August 2014. There has been talk of PokerStars re-entering the US market, but this does not seem likely in the near future. WSOP is another online poker website which is popular worldwide. While winning a bracelet at the World Series of Poker is the crowning achievement for any player, there are plenty of tournaments throughout the year that are high on the agenda of the best players in the game. World Series of Poker: The big one. If you win a bracelet at the WSOP you go down in history. Many different types of poker are played, with the tournament decided in many different cities. Aussie Millions: The big event on the Australian poker calendar, held at Melbourne’s Crown Casino. Many of poker’s biggest names converge for the January tournament, which runs for more than two weeks. Macau Poker Challenge: This tournament is not for the weak – it has one of the largest buy-ins out of any tournament. While it varies from year to year, there are generally events with buy-ins exceeding USD $1 million. Canada’s Daniel Negreanu, a divisive figure in poker circles, sits atop the all-time money list. The bubbly Negreanu is not short of a quid, having also been the face of online poker giant PokerStars. Other notables on the list include Antonio Esfandiari, Phil Ivey and Scott Seiver.